To talk to the Rewrite Team, join #historian'sdesk below!! For general chat, please go to #site19, the official SCP Foundation chat room. For non-specific staff questions, please go to #site17, the staff help channel. Ongoing rewrite requests and attempt records will be logged in this thread, as well as the results. Collaboration log prunings will be run out of this thread, which also contains a record of the logs we curate. So Crayne has asked us to start tagging official Rewrite Team sponsored rewrites, aka no "I'm letting this guy rewrite this article for me, k thx" with the tag of "in-rewrite" to make it easier for keeping track of what needs to be deleted and what doesn't. Also, we're getting asked to revamp the heritage list by the admins. Currently speaking, we have no official plan set in place for what we're doing, so we're open to all suggestions of what to do. This isn't limited to staff by the way, all ideas are welcome from anybody. RE: The first paragraph. Cool. That makes stuff simpler. I think that the second paragraph deserves a thread on the forum, as it's it's a minor BFD. What do they mean by "revamp," though? That's a word that can mean a lot of different things, particularly in this context. Yeah, I'd like some more clarification on what exactly you mean here. Also, try to get a hold of Clef. He was point man on it last time, although I don't know if he wants to do so again. All that I'm aware of is that the Heritage list is currently considered flawed. Now, I haven't received any word about why exactly it is flawed, so that would be some nice info to get. The Rewrite Guide has been posted with assistance from pretty much everyone. A number of policy changes have been enacted, as well. For more information on the changes in policy, refer to the guide. Most of the changes are designed to streamline the process and make it the same between Series 1, 2, and 3 articles, so there's not a different procedure with all of them. If you've got any questions or need clarification about the new policy, talk to either Troy or Cryo. User legendaryweredragon recently made a post in the "Are you a bad enough dude to rescue the SCP?" forum thread, after his post in SCP-122's discussion thread went unnoticed (I think it's this one: http://www.scp-wiki.net/forum/t-104157/scp-122#post-2027920). To note, SCP-122 is currently at +63 and the user in question does not have any successful work on the wiki up yet. I've told them to contact the members of the Rewrite Team. User Monocular Milkman recently contacted me in regards to get permission to edit a tale that's currently sitting at +10. I told them to contact Roget and have a proposed draft ready. Mulciber sent me a PM outlining an idea he had for the rewrite process that both myself and weizhong thought was at least interesting, posting it here for consideration and discussion. Just had an idea for rewrites I thought I would share. When an article is flagged for attention and a rewrite is proposed, do you often get more than one individual asking to perform said rewrite? I thought it might be interesting to make rewrites into more of a competition, since those seem to garner a great deal of interest. If two or more folks are interested in rewriting an article, you could have them submit their rewrites anonymously and have the highest voted submission "win" the spot; similar to what was done with the 2000 contest but on a smaller, more regular scale. I think anonymity would be an interesting new twist as well. Voting based on content alone makes revealing the winner a bit more of an entertaining spectacle. It would also allow for wild, amusing speculation as to who wrote which proposed version. Essentially a rewrite "mini contest" for articles with more than one volunteer. I could get behind that idea, since it could easily increase individual interest in rewrites by framing them as rewards instead of chores. Thoughts? Xiao is the author of 1974, he might be persuaded to hop on the saddle and mess with it. 664, we could shop around. I haven't read it in awhile but it shouldn't be too hard. UPDATE: Anaxagoras has volunteered to rewrite 664. I've sent him the PM, he'll get back to us by Monday hopefully. UPDATE: Anaxagoras has relinquished rewrite responsibility of 664, and we have reassigned it to Musuko; PM sent. Drewbear was concerned about 563, which is the article that got him on the wiki. UPDATE: Drewbear said he would do a rewrite of 563. Hopefully we'll be able to get it patched up by Sunday or Monday. I am putting SCP-166 up for rewrite. It's still positively rated, but I think we can do better than this with the themes we've got. 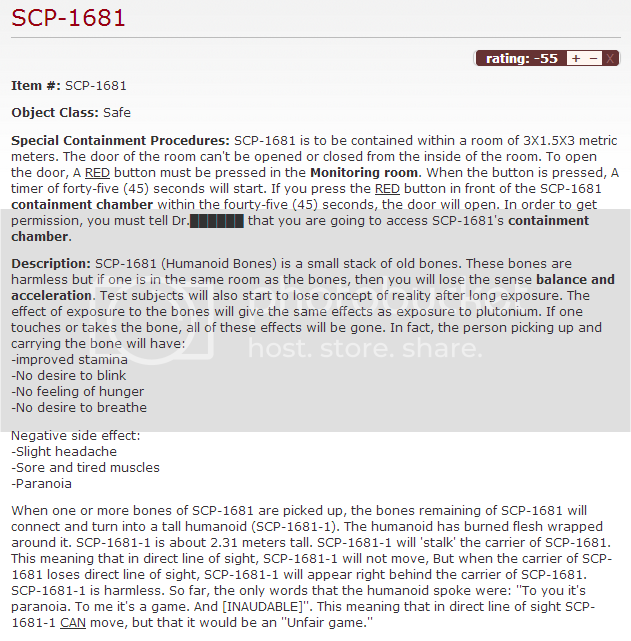 InfernalMaelstrom has requested to rewrite currently failing article SCP-1681 (originally by Dr Hamilton). I gave him the standard spiel and let him go at it, he's got until Monday to submit his draft. EDIT: InfernalMaelstrom informed me he has an exam on Monday and needed this weekend to study. I've extended the deadline to Friday for his draft. EDIT: I've added a timer to the page for Friday to keep people from freaking out about a -83 and dropping article remaining undeleted and to give us an official deadline. EDIT: InfernalMaelstrom sent me his rewrite here, under "1681 Rewrite". Guy named Soultear wishes to rewrite SCP-181. Since he's been on the site for a day, I decided to let him write up a draft so we can see if he's got the chops to do this for reals. I think it's about time we recognized SCP Classic as an official spinoff site, especially since the guy gave Clef owner and such. It's such a great project for one guy to have done, I think the least we could do is link to it. Troy: This sounds like a great idea, actually. Clef: Wait, I'm owner? When did this happen? The guy who did a rewrite on this one and had it reverted got permission from Sal, so if he hasn't added it back up we could re-revert it to the rewritten version, which iirc was much better, language-wise. Reimann has permission from Sal and took screenshots of the old article. Deleting it and allowing him to post anew. - Coincidentally, I was planning an Origins run about it, noticed it was low, and PMed the author asking permission to rewrite it. - Rewrite is complete. Will keep an eye on it and see what the score turns into. Currently stable at +5. Call for critical attention to an article with the intent toward spurring rewrites. Handle, or appoint volunteers to handle, rewrites of articles in danger of deletion. Approve or supervise rewrite drafts made by volunteers, if necessary. Handle, or appoint volunteers to handle, approved cleanup and updates of old articles, under administrative guidelines or supervision. Suggest articles to admins for featuring on the front page. Function as admin liaison when dealing with rewrites of 'classic' articles, or articles on the heritage list. Administrate all functions related the Heritage List of historically important SCP articles, i.e the addition of new articles, maintaining the page, and answering questions from users. If you're wanting to do a rewrite, there are a few policies in place that you must recognize. All Rewrite Team members are expected to be familiar with these policies. Also, check out the Rewrite Guide on the mainsite. 1. Rewrites require permission from the author. If you can't get permission from the original author within a reasonable amount of time, or if the original author is no longer active on the site, you have to get permission from a member of the rewriting team, preferably the captain and one other member. We recommend that you make this request in the comments of the article in question. 2. Rewrites require attribution to the original author. If you post the rewrite in a "clean" slot, you ABSOLUTELY MUST post a comment on the rewrite explaining that it's a rewrite and state who the author of the original article was. If the original author is unknown (i.e. someone other than the author ported it to this incarnation of the wiki), state "Original Author Unknown." This is a CYA under Creative Commons, and will be enforced. 3. Rewrites will, at the time of permission, be given a specific time limit for completion. If a page is up for deletion at the time of the request (which is often the case), it will not be deleted until that time limit has expired. If the page is getting to the point where deletion is becoming a real possibility, then a deletion vote will not be started until this time has passed. Extensions are granted rarely, so use this time appropriately. If the time limit passes and the original page is deleted, a rewrite can still be posted, but there are no guarantees that the original slot will still be open, and proper attribution will have to be made as noted in Rule #2. Stays of deletion for articles where the number is not part of the identity of the article will not be granted (meaning any article wishing to be rewritten that is less than two weeks old will still be deleted if so voted). 4. Rewrites are subject to the same voting process as the original article. What this means is that people are free to re-downvote the rewrite, if they still don't like it. This seems obvious, but people have been butthurt before because they thought that a rewrite "deserved" to get a better response than the original. 5. Rewrites of 'classic' articles should be faithful to the original article. A 'classic' article is defined as an article at least three years old. An article can also qualify for 'classic' status if it is referenced—in its current form—in at least three other articles on the site. Rewrites of these articles must be approved by the Rewrite Team Captain before being posted. Exceptions to this rule can be made, but they should not be expected. Check out the Rewrite Team Guide for information on the structure of this team. The following is meant to be used as a template for PMs sent out to users who wish to do rewrites of articles. If you think of anything that could be added to this template or does not need to be here, please feel free to edit it as necessary. Hello, (insert author name here)! We're very happy you've stepped up to rewrite (insert article here)! Now that you've been given the OK to pursue a rewrite, there are some things that we want to make sure you're aware of before you begin. (If the article is being given a stay of deletion)You will be given 24 to 48 hours to produce a draft, depending on the complexity of the project. If you need more time, please PM one of the Rewrite team explaining your situation, and we will review your case accordingly. (If the article is an update)We are asking that you provide us with a draft of your update after 3-4 days, depending on the complexity of the project. This is so you can look over reviews other users have given for the article and so you can see what you need to address. If you need more time, please PM one of the Rewrite team explaining your situation, and we will review your case accordingly. (If the article is a delete-repost rewrite) You are required to attribute the original author in the comments of your rewrite. When you have finished your draft, please PM one of the Rewrite team with a link to your draft so we can review it. You are free to seek out criticism from the community at large if you wish, but at a minimum you are expected to let the Rewrite team review your draft before posting to the site. Do not post your draft to the site without being given an OK from a Rewrite team member first. If you cannot finish your draft in time and/or do not wish to continue with your draft, let a Rewrite team member know immediately. (If the article is being given a stay of deletion, or is an update)Please remember that you are working on improving an existing article, not reserving a slot for your own SCP. If you use your (update/rewrite) opportunity to post your own unrelated SCP, your article will be removed and you will not be allowed to work on updates or rewrites in the future. (if the rewrite is a Series I SCP) While you certainly given a wide degree of freedom with your (update/rewrite), at minimum you are expected to preserve the overall emotional tone of the original article, as it is an important piece of wiki history. If you are unsure how to do this, the Rewrite team will gladly work with you to make sure the idea of the original SCP is intact and well represented. Thank you once again for taking on this project, and we eagerly anticipate your first draft! * (If the article is being given a stay of deletion)You will be given 24 to 48 hours to produce a draft, depending on the complexity of the project. If you need more time, please PM one of the [http://05command.wikidot.com/rewrite-main Rewrite team] explaining your situation, and we will review your case accordingly. * (If the article is an update)We are asking that you provide us with a draft of your update after 3-4 days, depending on the complexity of the project. This is so you can look over reviews other users have given for the article and so you can see what you need to address. If you need more time, please PM one of the [http://05command.wikidot.com/rewrite-main Rewrite team] explaining your situation, and we will review your case accordingly. * (If the article is a delete-repost rewrite) You are required to attribute the original author in the comments of your rewrite. * If you cannot finish your draft in time and/or do not wish to continue with your draft, let a Rewrite team member know //immediately//. * (if the rewrite is an SCP more than two years old) While you certainly given a wide degree of freedom with your (update/rewrite), at minimum you are expected to preserve the overall emotional tone of the original article, as it is an important piece of wiki history. If you are unsure how to do this, the Rewrite team will gladly work with you to make sure the idea of the original SCP is intact and well represented. The Rewrite Team has noticed you've expressed an interest in rewriting (SCP number). Due to the current rating, the page will be deleted, and the number will be not be reserved. That being said, you are welcome to post it under the same number if it's available.